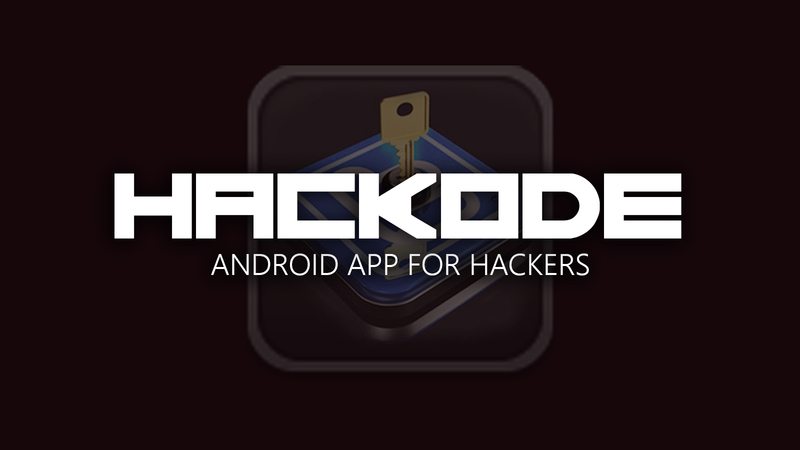 Hackode is an android app developed by Ravi Kumar for penetration testers, ethical hackers, IT administrators, and cyber security professionals. You can use this app to gather information about a target and to find vulnerable sites. 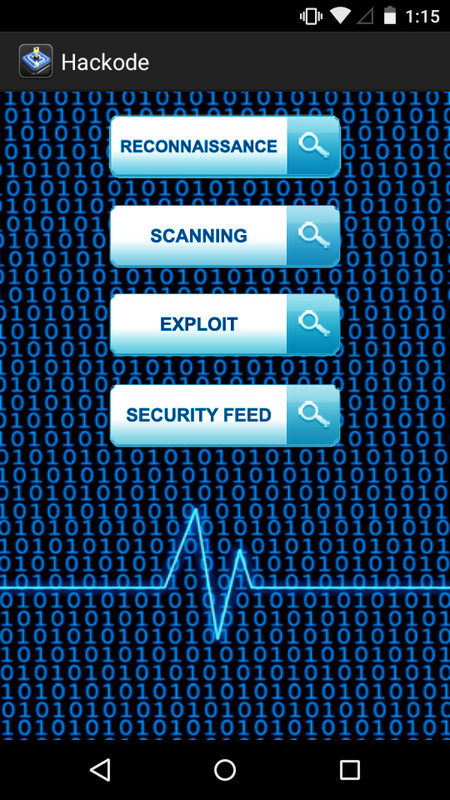 This app is a great addition to a security-minded android user's arsenal. Note: You must have a working internet connection. When you open the app, you will see four options: Reconnaissance, Scanning, Exploits, and Security Feed. PhpMyAdmin - This google dork bypasses the admin username and password and takes you directly to information schema tables of vulnerable websites. PhpConfig - This one will show you a Google search result containing vulnerable sites that may allow you to include malicious files to a web application (php remote file include vulnerability). 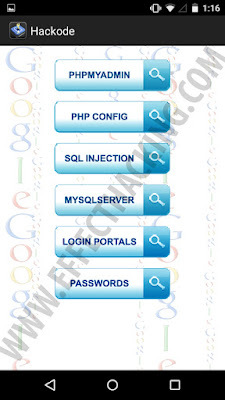 SQL Injection - This Google dork shows sites vulnerable to SQL injection attacks. MySQL Server - This shows a search result that may help you to get sensitive information from the target MySQL server. 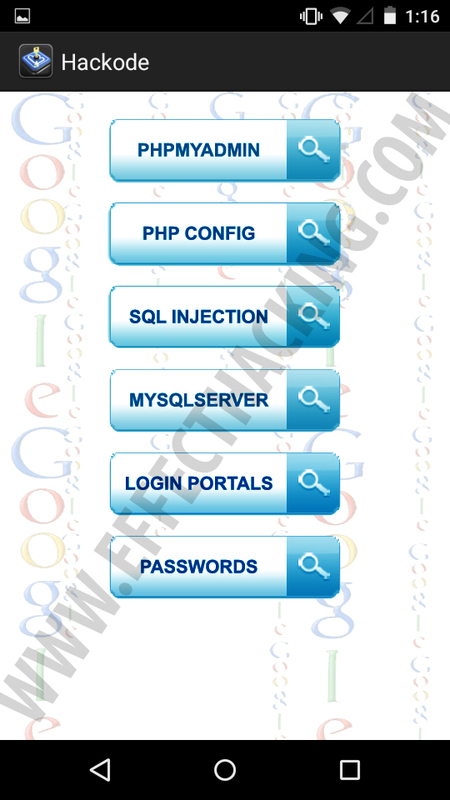 Login Portals - It shows a Google search result that contains simple SAMLphp login pages. Passwords - This google dork allows you to get files containing SQL instructions where the administrator set a password for a database user. 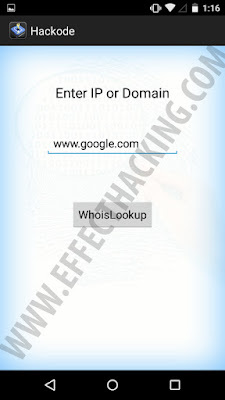 WhoIs Lookup: This tool allows you to look up information on domain names or IPs. This includes contact information as well as some technical information such as the domain’s name servers (DNS) used for service, and certain Status information such as the site status and the server type. 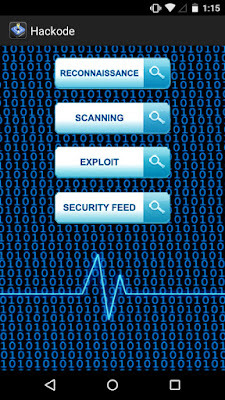 Scanning: Tools for scanning the target. Ping - It allows you to test the reachability of a host and to measure the round-trip time for messages sent from the originating host to a destination device. 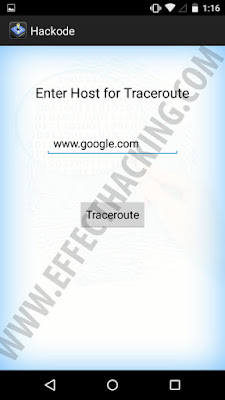 Traceroute - It allows you to identify the intermediate devices and the connection speed. Mx Record - It allows you to get information about the target's mail server which is responsible for accepting email messages on behalf of a recipient's domain. DNS Dig - It can be used to find Information about the target website's DNS server. Exploits: It is not ready yet and I don't think it ever will be. Because it was like this since 2013. Security Feed: It shows latest security news. Now you know the tools. If you have any doubts, feel free to ask. Is there a pro version of Hackode? Answer: No, there is no pro version of Hackode. How to use Hackode to hack Facebook? Answer: You can't hack Facebook accounts using Hackode. It is just an information gathering app. It is not designed to hack anything. How to use Hackode to hack WiFi? Answer: You can't hack WiFi using Hackode. If you want to hack WiFi, use the WIBR+ app. How to use Hackode to hack games? Answer: You can't hack games using Hackode. If you want to hack games, read the article "4 Best Ways To Hack Android Games". That's all. I hope you liked this article. If you find this article worthy, share this to your friends and followers.